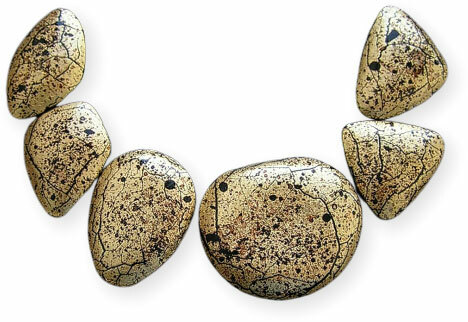 An appealing pile of what looks like polymer rocks from Russia’s Anna Bragina (Braga) becomes even more captivating when arranged into a necklace. 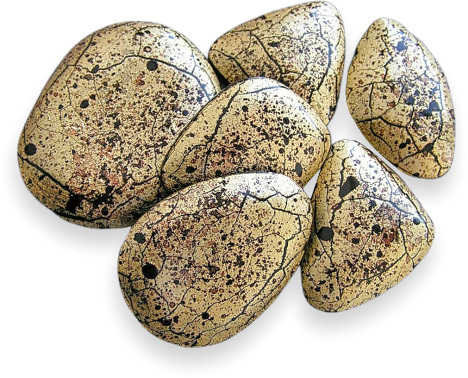 The stones could have been sculpted from the same block of granite. Some of her smooth shapes are available as cutters from the GF Art Store on Etsy. 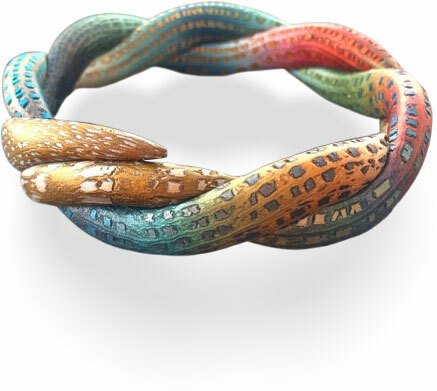 See what other pieces she makes with these graceful shapes on her Instagram and Facebook. 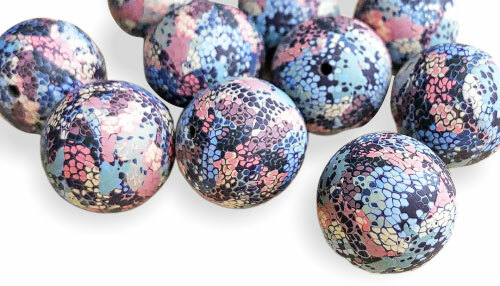 Moscow’s Juliya Laukhina covers her dark round beads with dense delicate dots of pastel colors. 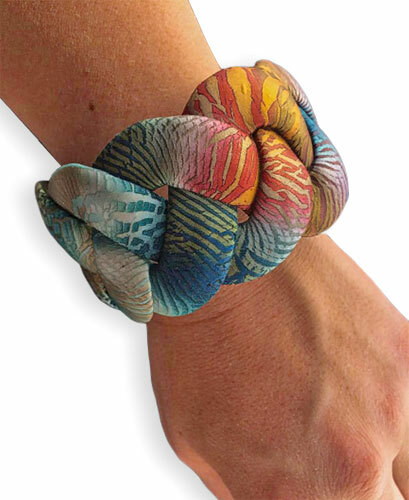 Is she using mokume gane off-cuts? Or has she taken another path? It doesn’t matter, of course. She mostly uses round beads of this size as her canvas and every time I check, she’s trying another method to decorate them. Juliya must have a science background since she’s methodical in her experimenting, only changing one variable at a time. These tight dots look like spring blossoms. She’s on Instagram and Etsy. Nebraska’s Ivy Niles (Ikandyclay) rolls a mighty fine cactus cane that can be arranged in any number of ways. 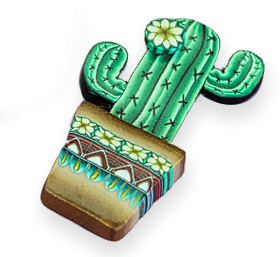 They can also be planted in cane slice containers decorated with matching designs. To create the cane gradations and the spiky needles requires a lot of head scratching. For those who prefer, she sells her canes ready-made and raw on Etsy. Her designs are marvelously complex. Some assembly required. 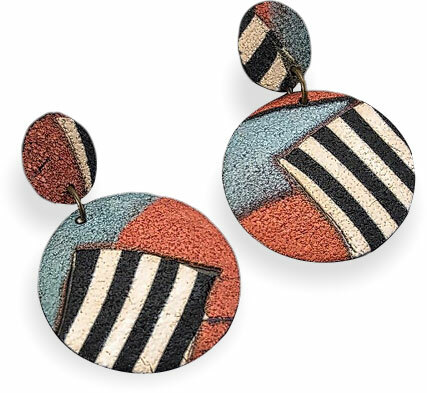 These arty, carefree collaged earrings from Germany’s Bettina Welker feel playful with their contrast and deep texturing. 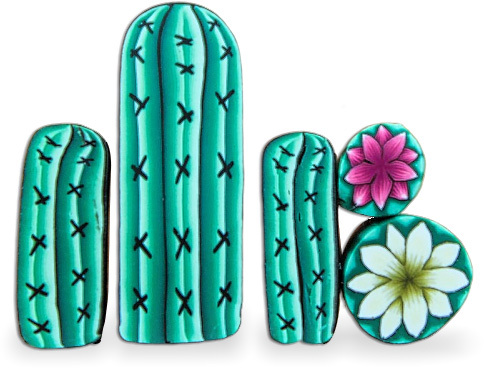 Bettina offers a whole collection of these springy Patchwork accessories on Flickr. 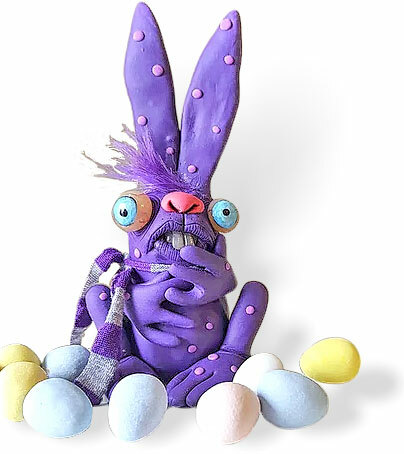 I’m having a hard time deciding which spring creations from Clayathon to include in this Saturday’s StudioMojo. There was so much going on and people were so willing to share that I’m having a grand time sorting out the ideas that were blooming all over the workroom. I may have to spread them out over the next two issues so that we can savor them properly. Come on over to discover what’s new.